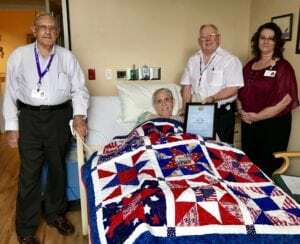 United States (U.S.) Army Reserve veteran William “Bill” Warner had a busy day at the Haven Suwannee Valley Care Center in Lake City. Warner was first recognized for his military service by volunteer veterans as a part of the Haven Pinning Ceremony for veteran patients, which includes a veteran pin, a thank you card signed by the staff and a certificate of appreciation from Haven. The presentation ends with a salute to honor the veteran’s service. Volunteers are a vital member of the Hospice Care Team. 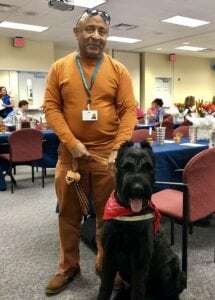 They provide companionship, support and assistance to patients residing at home, in assisted living facilities, nursing homes, hospitals and the Suwannee Valley Care Center. They also reach out to grieving families, help staff the Attic Resale Store, assist with administrative tasks and serve on special event committees. Haven is proud to have more than 700 community members dedicating their time and talents to patients and families in 18 Florida counties. If you would like more information about becoming a volunteer in Lake City, please contact Volunteer Coordinator Lauren Pinchouck 386.752.9191.